1) How dare you report about renewable energy with a tone of contempt for the big ideas that we truly need? I heard a story a month or two ago on WAMC (NPR station) about a plan for solar panels in the desert. The plan was not only to produce energy, but, in “planting” so many solar panels, to mimic the coverage of trees from centuries ago and thereby reduce the reflection of the sun and restart wind patterns which would then bring rain and regenerate the desert flora and fauna. The reporter ended the story with a scoffing attitude that implied failure without flat-out predicting it. But the damage was done. The reporting created the clear impression that this type of project is the stuff of nonsense and folly. The report did not mention the benefits of the process, underscore the value of the investment in local production, point out the successes inherent in incremental achievement, or remind listeners of the need for massive implementations renewable energy to keep us all alive on our planet. 2) How dare you report on a small town and their investment in natural gas fracturing without also detailing the serious societal and health burdens of investing in the infrastructure and extraction? A story about the tough decision a town was making, yet no mention at all about the climate and health side of the decision. The story I heard very kindly included “the environmental view” with a few people talking about concerns for water, issues with degraded public lands, even concerns about the possible increase in truck traffic (shock and horror). Yet there was no mention of air quality degradation and the many health issues including asthma, cancer, skin conditions, sleep pattern disruption, and learning disabilities, created by and exacerbated by burning fossil fuels. There was zero mention of the “external” costs of fracking and of fossil fuel use that we all bear through insurance rates, health insurance costs, and reduced land valuations. There was zero mention of climate change and the serious need to significantly reduce greenhouse gas (GHG) emissions. No mention of how incredibly foolish it is to invest in any fossil fuel infrastructure when we should not use that investment for even a week, let alone for the 30-50 years it would take to make that investment fiscally worthwhile. It was a story about the current financial prosperity of the town. Period. 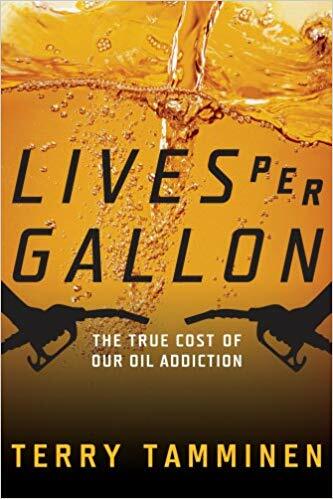 3) How dare you talk about the price of a barrel of oil and how this cost drives the stock market, talking about how a drop in costs will benefit business profitability, yet without ever mentioning the existing imperative to reduce fossil fuel use. How can you do this? How dare you? How dare we talk about, report on, or judge anything related to energy without mentioning that we cannot, as a planet, safely use any fossil fuels? It’s not about just maintaining the current level of use; it is not safe to use any more at all. And please don’t quote irony to me as I sit here typing on my i-pad, with my Christmas tree sparkling away, having just taken a lovely bath in water heated by my gas-fired on-demand not water heater. I get it, I am complicit along with you. And we will not make the changes we all must make if we don’t make changes to how and when we bring up the dangers (not issues, but dangers) of fossil fuel use. When I say “how” I mean that we need to talk about GHG emissions and the need to reduce those emissions, even drawdown the emissions. We need to talk about the biggest sources of GHG including cars and buildings, fracking and mining. We need to speak about the embodied carbon in materials so that we select, e.g., the healthiest and smartest insulation materials when building or renovating. We need to not only talk about efficiency and reduction, but more importantly about the effective use of resources. We need to learn not to use, for example, plastic (usually petroleum-derived), one of the most durable and ever-present never-degrading materials we know, for single use throw-away items! We must help more people to understand that GHG emissions is a necessary factor to consider in every decision. When I say “when” I mean ALL the time. I laud the detailed and quality reporting on issues when the topic is the issue, and we can do better by also reminding people of the issues in non-issue reporting on towns, businesses, and everyday lives. I should never again hear a report on NPR or any radio station about how a town didn’t exist 10 years ago, but is in a huge boom due to oil extraction unless the report also talks about the planetary consequences (health, resources, climate, cost) of that oil extraction. It’s great that the town has wealth and comfort, and yet this is not the whole story. We must create and continually recreate an awareness of climate change and the relationship to fossil fuel extraction and use. Even a small mention, as in a cigarette commercial, reminding people that fossil fuel use is detrimental to our health, would be transformational. Yes, we need that. A warning label on every tanker truck, each pipeline, each and every well, fracking pond, boiler, light switch and charging brick. The IPCC late last year issued a report that clearly states we have a scant twelve years to adjust the course of spaceship earth. We have hit bottom and need rehab. Serious rehab. All of us. Terry Tamminen was the Secretary of the California EPA in the Schwarzenegger administration, and he helped us to kick-off the work on the New York State’s Climate Action Plan 11 years ago. 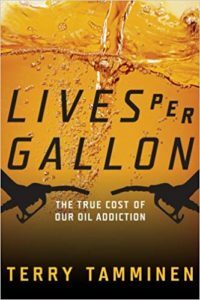 He wrote a book titled “Lives Per Gallon” in which he describes our relationship to fossil fuel. He explains tar sands extraction in this way (paraphrased): imagine a drunk going into a bar that has been closed for 30-plus years and needing a drink so much he willingly pulls carpet tacks out of the floor, pries the carpet up, cuts it into manageable pieces, soaks it in water, boils it, and then drinks the residual distilled alcohol, just to get a momentary, and dangerous, high. This is our “normal”. This is our addiction to fossil fuel. Our role…is to make it totally normal to intelligently consider and assess the climate impacts of our decisions. All of our decisions. So I repeat “How dare you?” How dare you report in the same way you always have? It’s no longer a situation where we have to give equal time to each side of this story. We are in a war to save the world and that is the singular side that exists this day, and this is the needed background for any news cycle. Our role, every day, each minute, with every single opportunity, is to make it totally normal to intelligently consider and assess the climate impacts of our decisions. All of our decisions. To understand the linkages, to illuminate the interdependence between us and nature, and to guide readers and listeners to a deeper understanding of the effects not in the mere one-year fiscal planning cycle, but in the more intelligent long-term focus. This is the job of the day in this global war. A war for our interdependence. Report the whole story, and be greener.